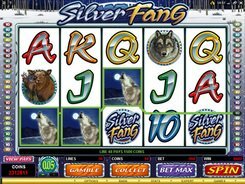 Silver Fang is an animal-themed slot played over 5 reels and 50 paylines. The symbols set incorporates playing card icons as well as mooses, wolves, and wolf paw prints. 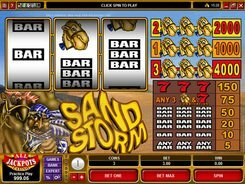 The slot features a wild, a scatter, free spins, a gamble feature, and the top jackpot prize worth $1250. Before any spin you can adjust the following bet settings: the number of coins per line (up to 10), a coin value (up to $0.05), and the number of win lines to place a stake on. Therefore, the top wager amounts to $25 per spin, which is a fairly affordable option for all budgets and bankrolls. The Howling Wolf acts a wild that helps create winning combos by replacing other symbols except for a scatter, which in this case is the Wolf Paw Print. 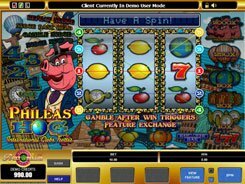 Three or more scatters pay out x5, x20 or x50 times a total bet and activate 15 free spins with all payouts multiplied by x5. 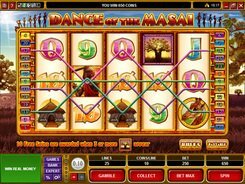 During the free spins feature a wild symbol appears stacked occupying more than one reel position. 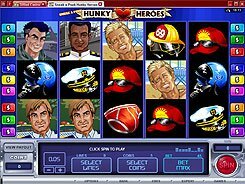 Free spins can be retriggered from within the free spins feature.